""" Lotto number generator for dojo"""
but we are going to extend it so that we ask our user to enter their 6 numbers and then use our random number selection code to simulate the lotto draw. We will keep going until the draw matches our numbers and then we will tell the user how many goes it took. """get 6 randoms from the pot"""
where we ask the user for a number and add that number to our list.
""" Lotto number generator 2 for dojo"""
"""get 6 numbers from the user"""
print "You won on draw"
print "The number of years it would have taken for your numbers to come up is"
So lets go through this to see what we are doing. Our first function draw_random is the same as above except for the line picks.sort() which takes our list and sorts it in ascending order. We do this to make it easier to compare out list of random numbers with our list of picked numbers. Our second function get_selection is where we get the 6 numbers from the user, again we sort our list before we return it. 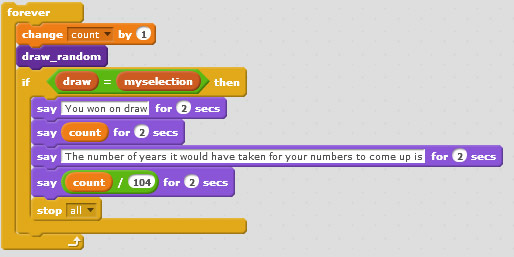 a forever loop in Scratch. We call our draw_random function and it returns a list of 6 random numbers to draw. After that we add one to our variable count and then check if our 6 random numbers are equal to the 6 numbers that the user picked. If they are we tell the user how many times we picked the random numbers before they matched and how many years it would have taken to do that in the real bi-weekly lotto draw. If they didn’t match then we tray again until they do. The main thing to take away from this is the general structure of our python program. It is worth typing the commands into the python editor as you get the hang of the python syntax. Also if you are running on an older computer be prepared for your program to run for a while. As usual don’t worry if you get stuck or have problems, I will give you a hand at the next dojo session but it is worth giving this or a similar sized program a try so you can get the hang of python and how it works.